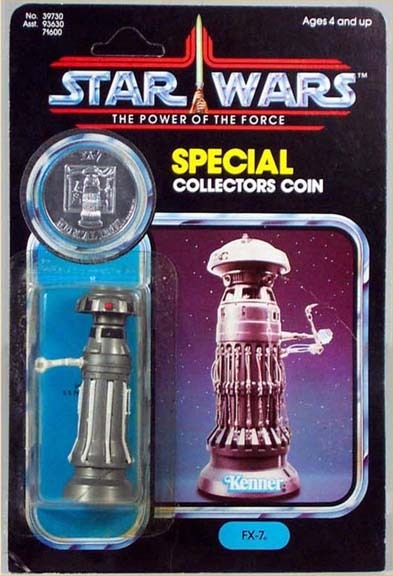 Any collector with an interest in the Power of the Force line will realize right off the bat that FX-7 was never produced. From an aesthetic point of view I'd have to say it's a real shame it wasn't ever released as the layout on this piece is spectacular. You'd be hard pressed to find another figure that looks this nice. The color scheme is just striking. 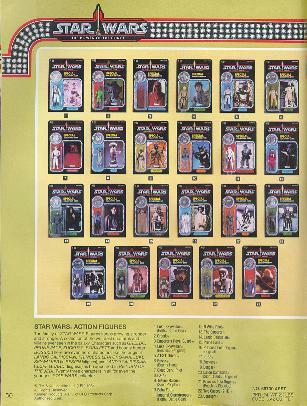 The figure you are looking at is the very same figure pictured here in the '85 Toy Fair catalog. You'll note the squared lower corners, as this figure was mounted onto a POTF proof card. Also worth mentioning is the prototype bubble that was used. If you look closely you will see that the coin and figure portions of the bubble are actually two seperate pieces hand applied and glued. This is one cool piece. It's a miracle any of these survived but to have one that is this attractive is a bonus.